Look down at your hands. Are they a mass of flaky, chopped up skin? Are they full of cuts and holes like a medieval leper? It doesn’t have to be this way! While CrossFitters’ hands take a beating between work on a barbell, pull-up bar, and climbing rope, there are a myriad of options to put some distance and protection between your buttery soft mitts and the forces that seek to tear them to shreds. There are two main options out there if you’re looking to protect your hands. Gymnastics grips have been used by, you guessed it, gymnasts for years to protect the vulnerable area where your palm and fingers meet during work on a bar. They generally loop over two or three of your fingers (usually middle, ring, and possibly pinky) and then strap around your wrist. A number of companies now make grips that are more CrossFit oriented. Make sure if you are buying them to get a pair without a dowel in them- the dowel is used in “real” gymnastics to make it super easy to maintain your grip, but is illegal in most CrossFit competition/the Open and will interfere with any other use of your hands. The second option is full hand gloves. These are mostly adaptations of baseball batting or mechanic’s gloves, with a tight fit and leather palms. When Reebok first started partnering with CrossFit, they began selling a CrossFit glove that looked suspiciously similar to the batting gloves they were already selling, but for $20 more! This still holds true- while there are lots of fancy options out there for most people a cheap pair of plain ol’ batting gloves will be more than sufficient. These gloves protect your whole hand but generally detract a little from your grip. It’s also worth mentioning conventional fingerless lifting gloves. You may think these make you look like Conor McGregor but they actually make you like an 80’s fitness instructor. They also make it impossible to effectively grip anything. Leave them in your mom’s basement, you can thank me later. 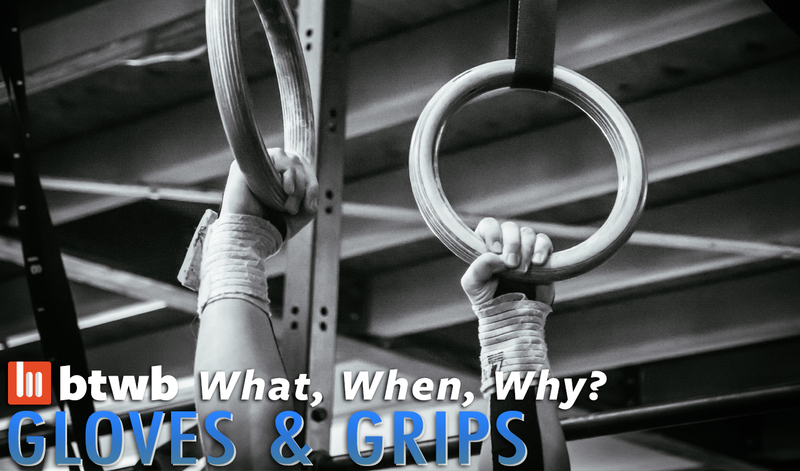 Gymnastics grips have a fairly limited use case- they really are only beneficial for hanging from a pull-up bar. Kipping tends to be what causes the most hand tears, so any movement with a kip- toes-to-bar, bar muscle-ups, etc.- will be easier with grips. Since you have to worry less about your hands, many find it easier to keep a tight and consistent grip on the bar and focus on technique and efficiency. One downside to grips is that they aren’t super comfortable to wear while doing barbell work- many will pull them off their fingers and let them hang open so they can grip the bar directly with their bare hands and then slide them back on when they get to the pull-up bar. Gloves have both a wider and narrower use case, depending on your viewpoint. You could wear gloves for everything- they are fairly unobtrusive and comfortable. That said, they will slightly diminish your grip and they aren’t generally thick enough to protect your hands from tears due to kipping movements. Where gloves really shine is rope climbs. Multiple rope climbs and fast descents especially, can be hard on your hands. Gloves are perfect for insulating you from rope burn, so if you’ve got lots of climbs in a workout, throw ’em on! It’s entirely possible to keep your hands happy and healthy by simply taking care of them and paying attention to them during workouts. First, the more efficient you are on a pull up bar, the less chance you have of ripping. You may notice that you tend to rip during the last few pull-ups of every workout- that’s usually because you are gunning for the finish and ignoring signals (like…PAIN) that otherwise would have you slow down and focus more on the quality of your movement. The better you get at everything, the more consistent your technique should be, but it sometimes makes sense just to slow down a little bit and ensure that your hands stay intact. Second, proper home hand care can reduce the build-up of calluses, which tend to be the “meat” that gets bunched up and ripped by the bar. I personally love the simple Tweezerman Callus Shaver, which is like a mini cheese grater for your hands. I use it when my hands are already dry, get them nice & smooth and then moisturize like a mofo. Some prefer pumice stones, files, or a few rod-like offerings that now exist. Whatever you use, caring for your hands at home will make them less prone to rip at the gym- and your significant other may even decide to start holding your hand if it doesn’t feel like a scaly orc claw.